The young and even the sophisticated may be unimpressed that the Gorman Theatre in downtown Framingham will close it's doors on April 30.But for many long-time residents of the community this evokes a touch of sadness with the knowledge that indeed this marks the end of a colorful era - a period in most small towns where a motion picture theatre was the center of it's cultural activities. Many a senior citizen enjoying the autumn of his or her life will look back with nostalgia recalling fond memories of his or her own, of parents or grandparents regarding the eventful 68 year history of Framingham's first theatre. 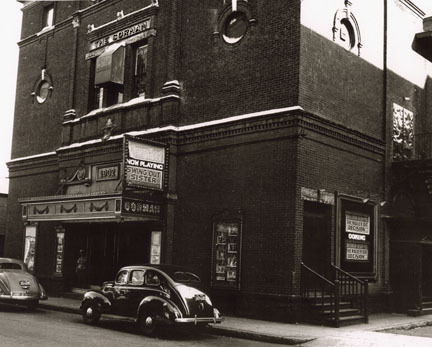 Some have already noted that the present building is located at the same Kendall Street site as the original, where an unusual variety of events was presented on the stage for 17 years prior to the introduction of talkies. 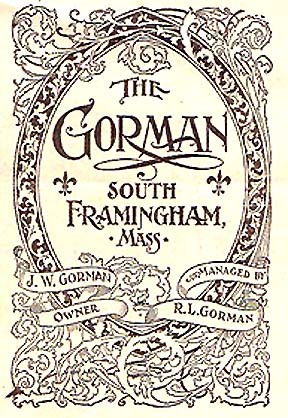 The Gorman, owned by the Gorman Brothers, Richard and John, burned while under construction. Once it was rebuilt, it was to become the haven for diving horse competitions, hose company contests, shaving contests, dramas, musicals, minstrel shows, vaudeville, stock, road shows, and even entertainment programs featuring local women's groups and students. The Gorman Brothers on occasion would bring their famous diving horses, which competed, in carnivals and circuses around the country to their Framingham theatre until their retirement years when they moved the horses to the Benson Animal Farm in Nashua NH. Among the crazes given equal time at the Gorman were the shaving contests in which barbers competed for the championship in a matter of seconds. An activity, which stimulated much interest and excitement, one of its champion barbers, was the late Harry Alexander Bent of Framingham. Jack Kelly and Tom Slade were the prominent names that come to light when mention is made of the famous hose company contest dating back 50 years. The Framingham Gazette on November 7, 1902 carried an interesting display advertisement on it's front page, announcing the Nov. 10 grand opening of the Gorman Theatre. The opening attraction, "The Village Parson" was described as "the most natural play of the age - thrilling in climax, powerful in action, intense heart interest - all special scenery." It concluded, "a story as sweet as the fragrance of roses." On the front page of Nov. 14 the Gazette advertisement read, "Don't fail to see Hazel Kirke at the Gorman, Monday evening, Nov. 17 under the auspices of the Knights of Columbus. Tickets 25 cents, 35 cents, 50 cents, and 75 cents." A Modern Playhouse Several years ago a copy of the opening night program of the Gorman Theatre, dated 1902-03, which belonged to Anne L. Williamson of 39 Concord St. Ashland and left to her sister, Eva MacMullin, was turned over to the Gorman Theatre by Mrs. William Bowen. Information included inside the red and blue program distributed that evening, included the fact that "all street cars wait until the house is emptied," "Extract from the Revised Regulations of 11892, Chapter 3, as amended" Section 10, Nor shall any person be allowed to wear a covering for the head so as to obstruct the view of any person in any such places." The detailed review of the opening in the Gazette was headlined "A New Opera House, a Successful Opening Night, Its Hustling Owner." It elaborated on the large audience present for the opening of the new Gorman Opera House in South Framingham and described it as "the new place for amusement and public gathering. It certainly is a gem, and judging by its first night which was necessarily arranged with a good deal of haste, and had many details to be looked after, the management is of the best." "Those who attended found one of the finest, modern playhouses which New England can boast of, capable of accommodating one thousand spectators. The main floor has a spacious lobby, plenty of floor space back of the seats and so arranged with hydraulic lifts that it can be tilted for stage entertainment and brought to a level with the rear and also the stage, when desired for general uses such as fairs, dancing or any similar purposes. Comfort of all patrons has been carefully looked after and the seats are spaced with ample room, comfortable in design, upholstered in leather, and arranged so that every seat is a good seat." The reviewer referred to the opening attraction, "The Village Parson" as "a thrilling tragedy, drama, impersonated by a well balanced company who has been touring the Eastern stages since their return from a successful season in England." Reference to John W. Gorman included "the owner is a native of Foxboro. He is modest and loves not to talk of himself so the Gazette man did not interview him on this subject. But he is about 48 years old. He early shoed a good head for business and in the seventies we find him appointed to take charge of the packing and shipping department of the Woonsocket Rubber Co. of Woonsocket, RI. He held this position for several years and came to South Framingham in 1882. Early productions at the Gorman included "Kerry Gow" "Kate Klaxton and the Two Orphans", Neil Burgess in "The Country Fair" with a real horse race on the stage in a treadmill and Bob Fitzsimmons and Denman Thompson and "The Old Homestead". Elephants, clowns, and acrobats were all part of the big circus acts billed here in the early days. A yearly event until April 1911 was "Uncle Toms Cabin" complete with street parade in the morning. In the line of march were the entire cast, bloodhounds and even Little Eva in a pony cart smiling to the children who had lined the sidewalks. Youngsters were known to climb the balcony for the matinee and watch breathlessly as Eliza crossed the Ohio on wobbling lumps on cardboard ice. Other tearjerkers included "East Lynne", "Quincy Adams Sawyer" and "Sheamus O'Brien" with hears and flowers played on the piano whenever the heroine appeared; loud minor chords for the villain and tender tunes for the romantic scenes.Road companies continued until about 1917 - The Firefly" with Edith Thayer, a resident of Cochituate as the star' and "Princess Pat" and many others. The year 1917 also marked the film debut of Geralcine Farrar in "Carmen", with music especially arranged for the opera. During these years the theatre was frequently taken over for a night or two of local talent. The Women's Club sponsored ""La Fiesta," which club members and scores of school children, their brothers and sisters participated.Mrs.Mark J. Brown handled leading roles, Mrs. George E. Tylee of Holliston and the late Robert E. Kerwin, when the Woman's Club presented "She Stoops To Conquer" at the Gorman.Professionals often came to town and directed local people in elaborate musical productions. The vehicles included "Fifi of the Toy Shop" presented by the short-lived Framingham Girls Club in 1917. In 1925 the Woman's Club presented "The Runaways" with the Philbrooks of Framingham directing Hester Flood, Louis Kingman of the Framingham Teachers College, Raymond Hilliard and the late Herbert E. Taylor in leading roles. The forerunners of the Civic League Players, the Framingham Dramatic Club, presented "Erminie" with the former Lillian Mason in the title role and the late Harry F. Scott as the innkeeper in 1953.Many of the town's more prominent amateurs were featured in Gorman productions. The old Company E production of "Santiago" in 1916 featured Hazel Chandler (Mrs. George Jacobs), Edna Berry and the late Madeline Hilton as the three young girls. Mrs. Jacobs directed all the Dramatic Club's major productions which, before Dennison Hall was opened in 1929, were held at the Gorman. They included "Only 38" with Louise Fiske and Gladys Johnson, "Under Cover" with Alberta Bowers and "The Man Who Stayed at Home" with Gladys Johnson. The Masonic groups sponsored a comedy, "Are You A Mason?" From this emerged the Jack-O-Lantern club, which remained in existence until about 1943. To be eligible for membership, an applicant was required to have had a major part in a play at the Gorman.The then Miss Chandler directed many plays for several seasons. Cast members included Dorothy Larned, Gladys Johnson, Louise Fiske, Alberta Bowers, Dorothy Cole, Elizabeth Sawyer, Olive Bullard Taylor, Raymond Hilliard, Madeline Hilton, Harley Varney, Col. George Downes, Perley Davis, Winthrop Pond, Henry F. Scott and George Jacobs. Mrs. Merriam wrote plays that the Jack-O-Lantern Club produced. While a sophomore of Harvard in 1922, Granville Hicks wrote a musical comedy, "Some Speed," which was presented at the Gorman Theatre under the direction of Miss Chandler. Clayton Flagg, who starred, later went on to the professional stage. Season of Stock While movies were on the upgrade, the Gorman occasionally offered a season of stock including the Augusta Perry Stock Company and the Henry Augustin Co. It was in October 1911 that the coronation o9f King George V and Queen Mary was shown in color. Popular plays and musical comedies, which came here for one nighters, were advertised on billboard on the one story shack that housed the J.J. Slatery cobbler shop. Winter stage manager at the Gorman in those early days was "Captain" Johan E. Driscoll of 10 Hollis Ct. When Richard Gorman brought his chain of summer theatres, then referred to as summer parks, throughout Maine and New Hampshire, "Cap" Driscoll traveled with him as stage manager. John Hawes, a resident of 104 Tripp St. who had worked as a water boy when the building was being re-constructed, began work at the old Gorman as an assistant treasurer. Later he was promoted to Manager and served in that capacity for about eight years. Still later he became the owner and producer of the musical extravaganza, "Little Miss Kut Up" which prompted him to leave the local theatre and take the new production on the road, visiting cities and towns all over the country. Frank Witcher of 145 Lincoln St. was another local resident associated with the Gorman from 1912-1937. Clad in a policeman's uniform and badge, he would open and lock the doors of the theatre and collect the tickets at the door. It was in June 1955 that the Gorman Theatre and the Concord Street St. George Theatre (formerly the Princess Theatre of 1908) torn down early in 1968, observed the 50th Anniversary of motion pictures in Framingham. At that time, Herbert N. Jost of East Princeton, earlier of Framingham, the first picture operator at the Princess, recalled that the first moving pictures in Framingham were shown periodically in a hall which is now the vacant store lot on Concord Street which formerly housed the J.J. Newberry Co. and the present Framingham Cooperative Bank building. While Jost was an employee of the Princess, there came a day when the Gorman Manager asked him to distribute programs and hand bills instead of laying him off because a musical traveling show arrived at the Princess. It was during this period that the popularity of vaudeville decreased and it was finally deleted from the program. Another name affiliated with both downtown theatres was Alden Peterson, General Manager for Giles Theatres for 12 years. Frank Witcher recalled back in 1955 that the nickelodeon, stock, road shows, musical comedies, burlesque, one night shows and vaudeville, of many descriptions were popular features. One night shows boasted such celebrities as Rudy Vallee, William S. Hart, Vincent Lopez, and Douglas Fairbanks Sr. who were then coming into their own as entertainers. It was in 1916 that a photoplayer, an instrument with numerous sound effects including bells, whistles, horns and sirens was installed at the Gorman. Miss Gertrude Collins, who later became Mrs. William Galvin of 15 Valentine Road, had joined the Princess Theatre staff as a substitute in 1913 when the regular pianist, Gladys Bates Wells became ill. When Miss Bell announced she was not planning to return, Miss Collins gave up her position at the Dennison Mfg. Company and became her successor. When the photoplayer was installed, Mrs. Gavin was instructed to operate it. She also controlled the double turntable with the library of words and sat on a darkened stage choosing the records to accompany the picture as the plot progressed. When the management decided it could replace the drummer, a strike resulted and pianist Galvin along with the drummer and another pianist, Anne A. Lawless (Mrs. Edgar A. Bowers of 175 Warren Road) were forced by the union to stop working. Mrs. Galvin obtained a job as a pianist in Milford and was placed "on call" at the Gorman, playing on and off for evening performances until 1921. Jost transferred to the Gorman as an operator, electrician and stage manager when the Princess was taken over by the Giles Co. The Princess was torn down in 1917. A handsome Esty Organ was installed at the Gorman Theatre in 1925 and Mrs. Galvin played it until the talkies were introduced. Then she continued as pianist, playing the overture during intermission and the finale. She remained in this capacity until 1929 when she left the entertainment field. William Hartnett, Manager of the Waltham Embassy Theatre since leaving Framingham in 1933, had worked as an usher and general utilitarian at the Gorman since 1924, when he as made Manager four years later. During that period, silent pictures and vaudeville were interspersed with occasional stage shows that at one time starred Joe Rines and his orchestra. Many of the famous bands that were appearing at the popular Lyonhurst Ballroom in Marlboro often made one-night stops at the Gorman. Sound was installed here in 1928 and from that year until 1939, vaudeville was the popular attraction until talkies replaced it. Hartnett left the Gorman in 1930 to manage the St. George. From the early 30's until the fall of 1952, the 5th Manager at the Gorman was Anthony Capobianco, who now works at Ken's Steak House. Uncle Ned Variety Shows were popular Friday night attractions and the late Eddie Erkheart of Boston conducted them. The late George Sumpter, long time manager of the St. George, also took over the managerial duties at the Gorman when Capobianco left for military service in 1942.